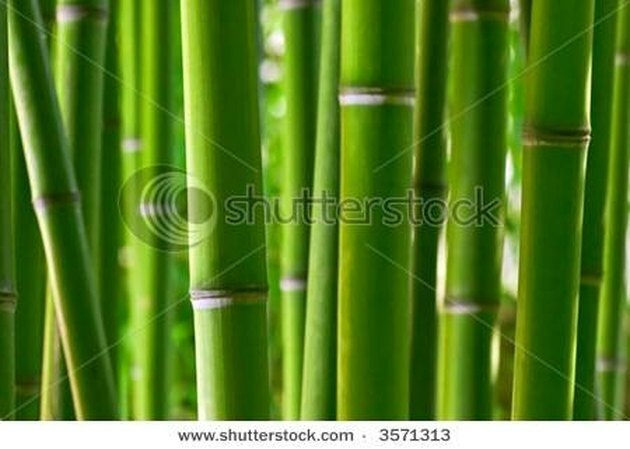 Bamboo plants are easy to grow as long as certain rules are followed. Bamboo loves sunlight, but more shade while young. The plants need lots of water, fertilizer aids in growth, and keeping weeds away is important. Bamboo grows best outside in the ground, but growing it in pots is possible. Better care must be taken to ensure the potted plants get lots of water and shade in the hot summer sun. It is just as important in winter to make sure the bamboo doesn't freeze. Just remember that any plant can thrive as long as its needs are met--potted bamboo is no exception. Choose a large ceramic pot, 12 by 12 inches, with holes in the bottom for proper drainage. Fill the pot with a loose rich soil and peat moss. Bamboo plants appreciate well-drained soil. Place the plant in the pot by burying the bamboo rhizomes in the soil 2 inches deep. Apply an all-purpose fertilizer in the pot with the bamboo plant once every two months. Change up the fertilizer to a nitrogen-rich brand every six months. Water the bamboo plant thoroughly to keep the soil moist. Bamboo plants need lots of water, but never let the water pool around the rhizomes.